Lake Nakuru National Park, Kenya. 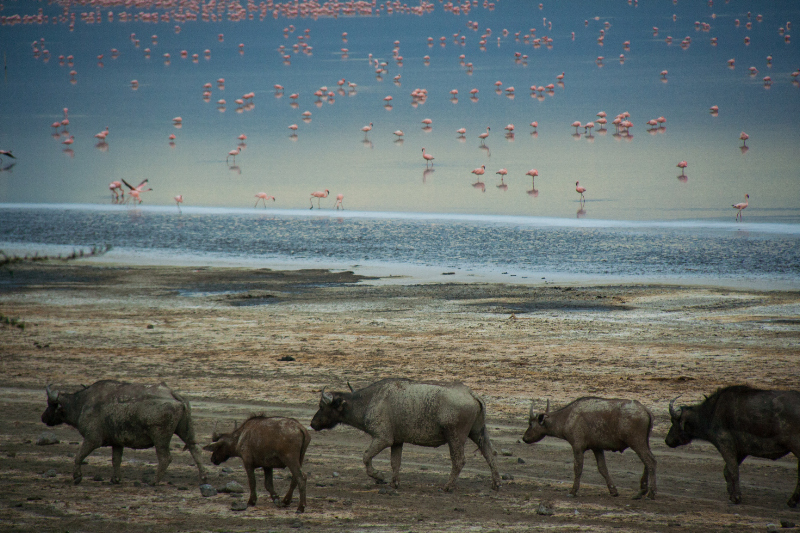 Lake Nakuru, famous for the large flocks of flamingos. During my visit the numbers were not that great. At the end of an afternoon exploring the shores and cliffs of Lake Nakuru, I was about to head back. The sunset was already on its way. The African buffalos had taken their mud bath and the entire family was walking parallel to the shore lines. Hardly any breeze, so the soft blue evening sky with some illuminated clouds was reflected in the lake. Almost a mirror, reflecting images of the lesser flamingos still foraging. The dusk with still some hints of fresh light illuminated the lake scenery in an a way that gave it a feel of a Magical Realism painting. I’ve rarely seen dusky light paint a landscape so subtle and delicately.